This is really simple but elegant! Combine sour cream and brown sugar. 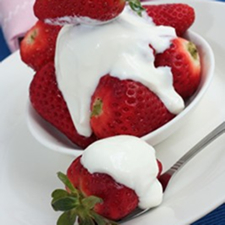 Place about five strawberries in each glass or dessert dish and drizzle each with 2 tablespoons of cream sauce. So what else is in season? While many fruits and vegetables are available year-round, most are at their peak and usually cost less and taste best during specific seasons. Our helpful produce guide lists the season's best options.